Today was the first day of the ISO meetings here in Yokohama. I tried to sleep to 07:30, but woke up irretrievably a bit before 06:00. So I ate the banana muffin I’d bought last night, then did some stretching exercises, before heading out around 07:00 to find something else for breakfast. I found a Sunkus convenience store in Queen’s Square, where I bought some prepacked sushi rice things. The nori wrapped ones from 7-11 have pictures on them so you can take at least a good guess as to what fillings they have, but these Sunkus ones only have Japanese characters on them, so it’s a complete gamble picking one. The random one I chose had salmon in it, which was kind of a jackpot. I also got one with no nori, where I could see the rice had bits of egg in it, and was coated in sesame seeds. After eating, it was down to the adjoining conference centre to begin the ISO meetings. The first session was all the preliminary administration type stuff, which ended early at about 11:40. I went to lunch with Margaret, Jonathan, and Scott Geffert. Margaret said that the hotel concierge had told her about a good Japanese restaurant in Queen’s Square, so she led us there, after a bit of confusion over which lift to take. When we sat at a table and saw the menus, we realised they were only offering a lunch special at this time, with a very limited and uninspiring selection of meals, so we decided to leave right away and go try something else. Margaret led us down into a basement level, where there was a bunch of restaurants lining the sides of a corridor. We went into one that had a sushi conveyor, and found Katoh-san and some other of the Japanese delegates sitting at a table, eating spectacular looking plates of sushi. They told us to grab the big yellow tickets at the front of the restaurant, to get what they were having. This seemed to be some sort of discount system with limited availability, as the tickets were numbered, and once the waiters saw we had them they signalled to the sushi chefs to prepare the special dishes for us. 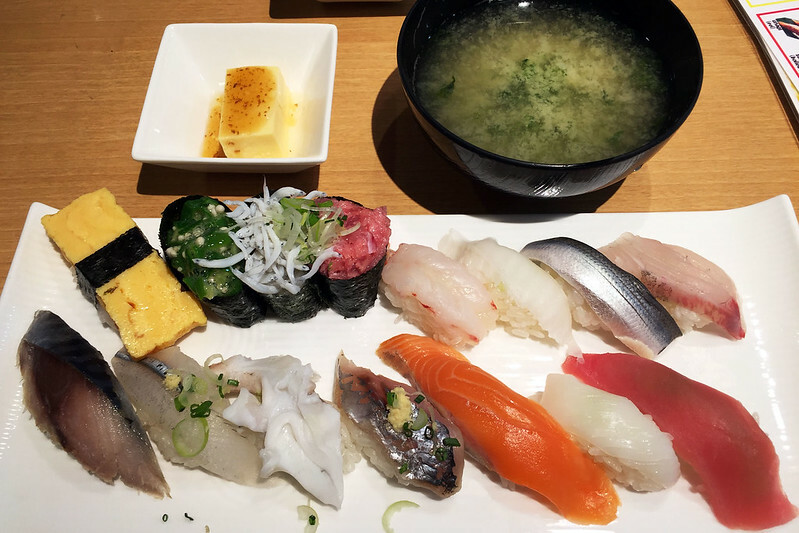 We each got miso soup, a savoury sort of custard thing, and then a plate consisting of fifteen pieces of assorted sushi, all of them different and presenting a beautiful set of textures on the plate. And when we finished and went to pay, we discovered that it cost only 1000 yen each! (About $10.) It was amazingly good for the price. The afternoon session of the meetings progressed quickly, so we actually moved some things from Thursday to discussion today. We finished at 17:00, with instructions to go to the Mayfair room on the 30th floor of the Intercontinental Hotel (right next door to the conference centre) for the meeting reception event, which got underway with drinks at 17:45. In between I returned to my room on the 9th floor of the same hotel, to have a bit of a chat with M. via FaceTime. Buffet at the meeting reception. I showed up at the reception in time for the serving of drinks. Someone pushed an Asahi beer into my hand almost as soon as I walked into the room. The room had a magnificent view looking out over the giant Ferris wheel and surrounding neighbourhood of Yokohama. Matsuhashi-san from Canon had brought his wife and university-student daughter to join the fun. He introduced me to them and said his daughter had been on a student exchange to Brisbane, and so she thought she spoke good English, but he didn’t think her English was so good and wanted her to practise by speaking to me. So I spoke to her for a bit, and her English was okay but a bit shaky – but I never caught her name. After a while, food was served. I wasn’t sure if we were just going to get some appetiser finger food and would have to go for a proper dinner afterwards, but it turned out that it was a full-on buffet dinner. 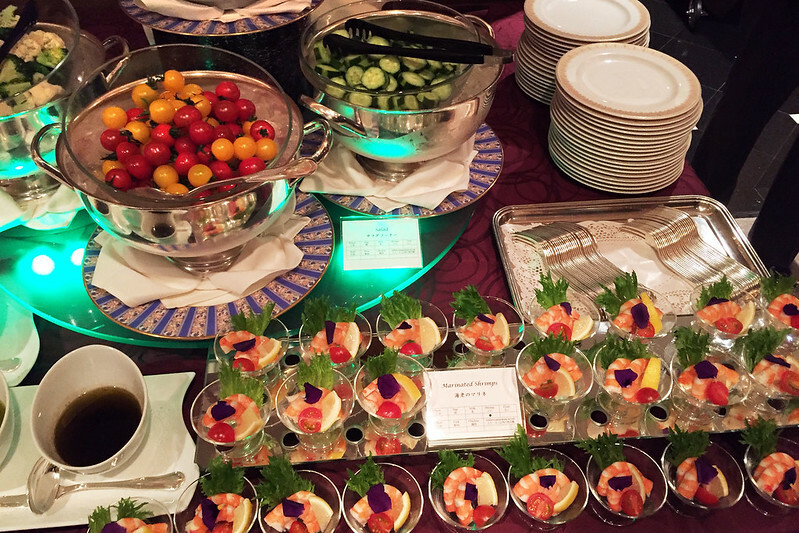 There were several salads and vegetables, then about ten different dishes of various meats, chicken, fish, and other seafood, prepared in a variety of ways, with Chinese, Japanese, and Italian dishes. Since there are Chinese, Japanese, and Italian restaurants in the hotel, I figured they must have raided the kitchens of those. Some of the dishes included: fried rice; sweet and sour chicken; pasta with a tomato sauce; bocconcini, tomato, and pesto salad; prawn cocktails; some sort of curry; and heaps more. After the main meal was done, there were dessert choices of almond pudding, strawberry shortcake, and apple strudel. Ms Sasaki provided entertainment at the meeting reception. Over this dinner, I mingled with various people and had a variety of conversations. 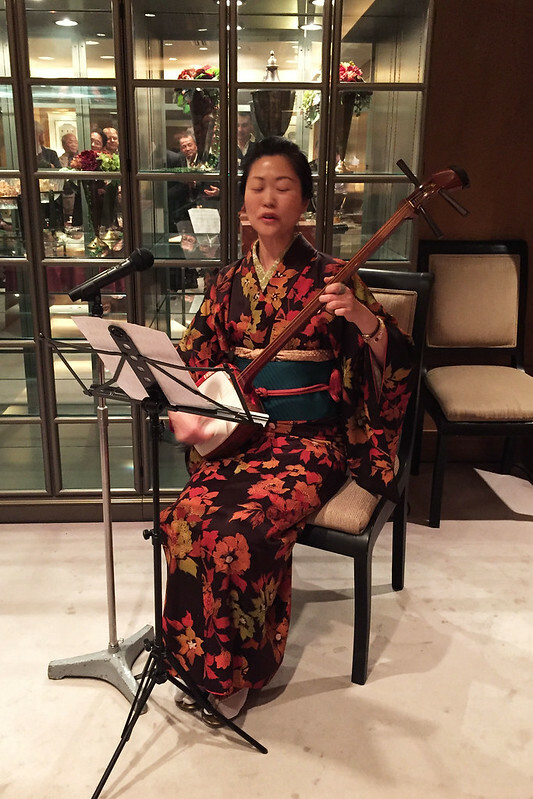 After eating, there was a musical performance by Yoshida-san and Ms Sasaki, playing recorder and a traditional Japanese stringed instrument respectively, very similar to the performance they did at Sapporo last year. The reception went until 20:00, but I left a bit early as I was getting tired. I returned to my room, had a shower, and wrote up some diary before bed. This entry was posted on Sunday, 17 April, 2016 at 20:03	and is filed under Diary. You can follow any responses to this entry through the RSS 2.0 feed. You can skip to the end and leave a response. Pinging is currently not allowed.